We are all over PC gaming this week, but what do we know about PC gaming? Each day, one Kotaku editor will reveal their PC gaming knowledge and share some memories. Yesterday, you read about Luke Plunkett's love for PC gaming, now it's my turn. Are you a PC gamer? I've always been more of a console guy, dabbling in PC gaming with the likes of Counter-Strike, StarCraft, Quake, Diablo, Half-Life and Team Fortress 2. But when I dabbled, I dabbled hard, sinking dozens of hours into each and every one of those games. As a fan of video games who currently owns two Macs, but not a version of Windows more recent than Windows XP, to call myself a PC gamer would rightly label me a poseur. I've never played a SimCity or an X-COM or a Myst or Oregon Trail. But I have played Baldur's Gate, if that helps my case! Two unsatisfying early PC gaming experiences may be to blame for my aversion to calling the PC my platform of choice. What was your first PC Game? 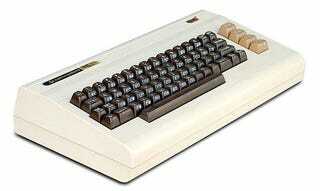 But my first piece of hardware was, sadly the Commodore VIC-20. It soured me on PC gaming in two ways. One, I owned Radar Rat Race, an abysmal Pac-Man-like. Two, I spent hours typing in code to render a Jack O'Lantern on my parents' television. I've rarely been more disappointed. Did consoles ever get in the way of your PC gaming? Only for about 15 years or so. My bread and butter was console gaming. I invested heavily in the Atari 2600, NES, SNES, Genesis and PlayStation. I hungered for a Turbografx, Intellivision and Nintendo 64 when I couldn't afford them. I found PC gaming to be a hassle. In the '80s, a close friend who owned an Amiga was quite proud to have Dragon's Lair playable at home, but I found the need to swap its mountain of floppy disks in and out of drives unacceptable. These were the formative aggravations that kept me on consoles. Fortunately, when Quake, WarCraft II and Half-Life came along, I wised up and realized I'd been missing out. Building my first computer from scratch. It didn't hurt that this was the machine on which I played Grim Fandango, StarCraft, System Shock 2, Quake II, Half-Life and Rainbow Six. But now I'm happiest that people like Valve, id Software, Blizzard and a few others are supporting OS X. We had purchased a new home computer from IBM, sporting what I thought was a pretty sweet 386 processor. Unfortunately, it lacked the math coprocessor that would have let it play games more visually spectacular than Solitaire. I discovered this after purchasing a budget priced version of Manhunter: New York, a Sierra adventure game I thought was pretty sweet looking. It didn't work. A PC gaming friend of mine visibly pitied me and it was the last game for Windows I purchase in a long time. Which PC-based game series should they bring back? Shadow of the Beast! The developer, formerly Reflections Interactive, now Ubisoft Reflections, has been in full Driver mode for the past decade. A return to their classic Amiga side-scrolling platformer series is overdue—if only so that we may be granted more awesome Roger Dean designed box art.